AllAboveAll | Come Check out Our NEW Site! This week, we saw a glimpse of the tragic consequences of the misguided effort to “end abortion” by forcing healthcare clinics that provide abortion services to shut down. A 39-year-old mother in Montour County—the smallest county in Pennsylvania–was sent to jail after ordering abortion-inducing pills for her teenage daughter. The woman, a professional nurse’s aid, told police she couldn’t find any abortion clinics nearby, and her daughter lacked health insurance. 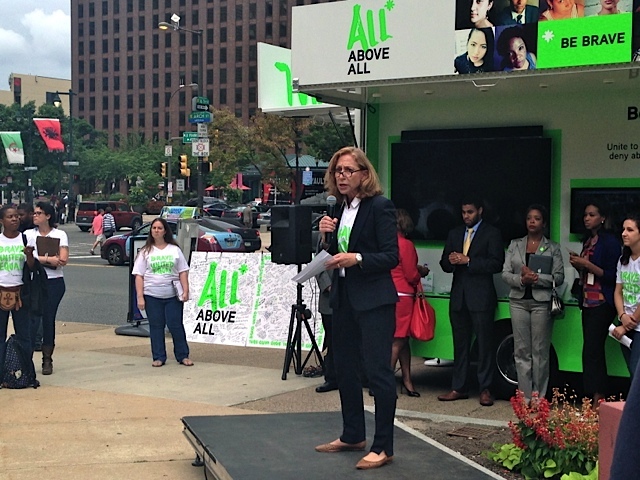 The news underscored the need to expand access to safe and legal abortion care in Pennsylvania, a goal shared by All Above All, a national group that stopped in Philadelphia Wednesday to host a rally in Love Park. Since the passage of the Hyde amendment in 1976, Congress has withheld coverage for abortion services from women insured through the Medicaid program. Currently, nearly 1 in 7 women of reproductive age (15-44) is insured through the Medicaid. The percentage of women insured through the program is rising, as more states expand Medicaid with federal funds provided under the Affordable Care Act (ACA). The problem isn’t just the Hyde Amendment. Last year, Pennsylvania lawmakers made it impossible for a woman to buy an insurance plan that covers abortion through the online marketplace. An exception to protect the health of the mother was explicitly rejected. Now, a woman with a health insurance plan purchased through the marketplace has to pay out of pocket to end a pregnancy, even if she faces a serious health risk like cancer. Wealth should not be a prerequisite to exercise constitutional rights. The advocates who gathered in Love Park know this all too well. Jessica Arons, of the Reproductive Health Technology Project, says it takes bravery to take on the issue of abortion funding at this time, when abortion opponents have succeeded at curbing access to abortion across the country, but she says the issues are related. “Not having insurance coverage for abortion care, not being able to afford an abortion procedure just compounds the problem so let’s say she finally gets to the clinic, she still has to pay for it so that’s why we’re working on both,” Arons said. Another way to try to make abortion unaffordable for poor women is to shut down providers. Though there is plenty of evidence that these regulations require prohibitively expensive architectural renovations, there is no evidence they improve patient safety. Given the shrinking number of clinics in Pennsylvania, it’s not surprising that we are starting to see evidence of women turning to the black market, despite health and legal risks. Contrary to the rhetoric of lawmakers attempting to shut clinics down by any means necessary, forcing abortion clinics to close doesn’t “end abortion.” It only ends access to safe, legal abortion for working and poor women. The All Above All rally featured speakers included Philadelphia Councilwomen Cindy Bass and Blondell Reynolds-Brown, Rabbi Lori Koffman of the National Council of Jewish Women and La’Tasha D. Mayes, Founder and Executive Director of New Voices Pittsburgh. All Above All road trip has made stops in California, Oregon, Minnesota, Illinois, Massachusetts, Connecticut and New York before stopping in Pennsylvania this week. Next, they’re headed to Washington, DC. Missed the rally? Ask your representatives in Congress to lift restrictions on abortion coverage by signing the petition here. This entry was posted in Abortion Access, PA Legislature, Reproductive Rights, Women's health, Working poor and tagged abortion access, Affordable Care Act, All Above All, AllAboveAll, CBS Philly, health insurance coverage, Hyde Amendment, Reproductive justice. Bookmark the permalink.